What happens when mister Ice Cream and miss Shaved Ice get frisky and have a love child? Out pops Ice Snow (also commonly known as Fluff Ice). I first tried this mind boggling dessert two summers ago at Class 302 in Rowland Heights, which according to Yelp is still the best ice snow place in LA. The texture of ice snow is the genius part - it is airy and fluffy unlike traditional dense ice cream yet it still has a creamy consistency. I closely observed how it is made when I went to Salju Dessert in Alhambra. The ice cream comes in an icy cylindrical block. Then it is placed in a shaved ice machine to get shaved down. The result is tiny little strings of ice cream. 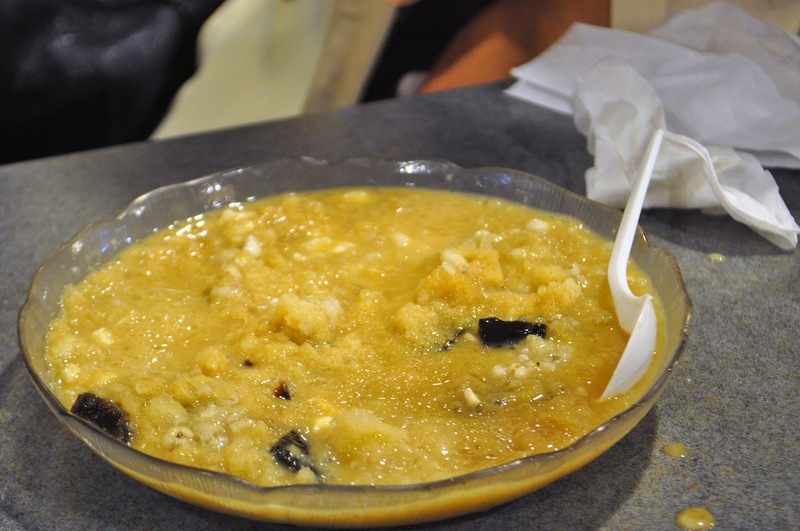 The preparation is very similar to Taiwanese shaved ice - various toppings like red bean, taro, grass jelly, mochi and condensed milk. Salju was definitely not as good as Class 302 but it is a much closer option. A popular ice snow place on the westside that I really need to try is Blockheads. And in case you don't know what Taiwanese shaved ice is, it is the best non dairy alternative to ice cream (just don't add condensed milk). A couple of high school friends and I headed to Sinbala in Arcadia for dinner which also serves Taiwanese shaved ice. So instead of the toppings being technically on top, the toppings are at the base of the dessert with the shaved ice piled on top like a tower. 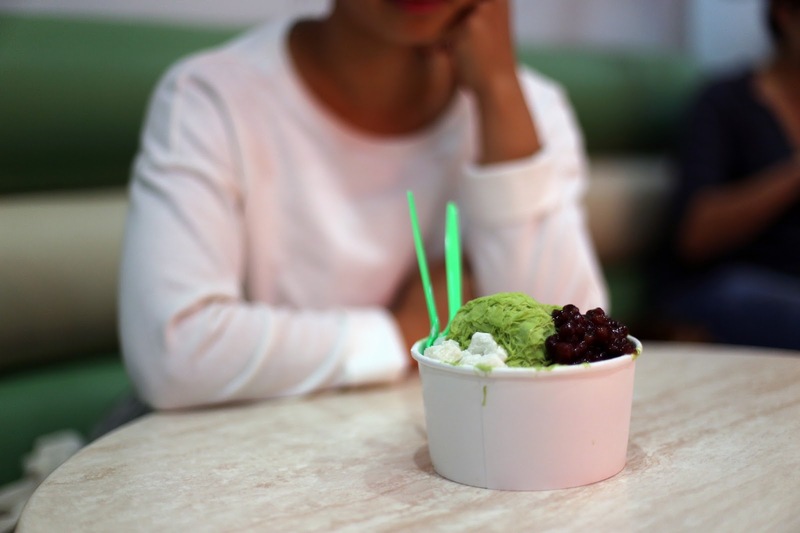 Taiwanese shaved ice toppings are a little different from those you find at say Yogurtland. You can get items like barley, red bean, aiyu jelly, almond jelly, taro etc. 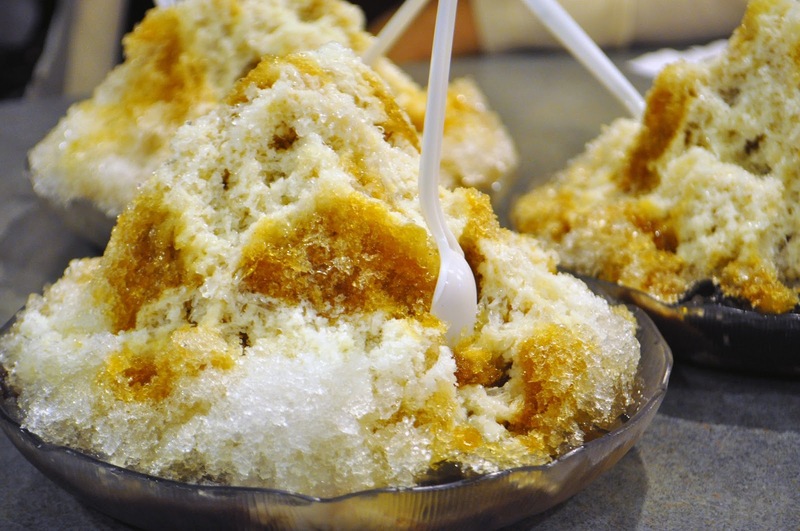 The shaved ice part is then topped with a healthy drizzle of condensed milk (optional) and brown sugar. I grew up eating Taiwanese shaved ice so this is my absolute favorite dessert of all time. It reminds me of Sundays when my mom would drive us from Torrance to the San Gabriel Valley to buy groceries, go to our optometrist, visit friends, and eat shaved ice, which was the only way she could get my brother and I to shut up in the car ride home. I was complaining to myself the other day (in a very first-world urban-centric way) that were just aren't very many ice cream places in LA. I'm talking ice-cream ice cream, not yogurt, not soft serve, not popsicles, and NOT gelato. Everyone knows about Scoops, famous for its brown bread ice cream, and Milk, the only Mid-City option for ice cream. Diddy Riese has commercial ice cream, but the ice cream sandwiches (and their low cost) are to-die for. My favorite place hands down is Mashti Malone's, and I always get the mango ice cream there. But Mashti's is so far when you're faced with LA traffic... I was in an uninspired ice-cream rut. 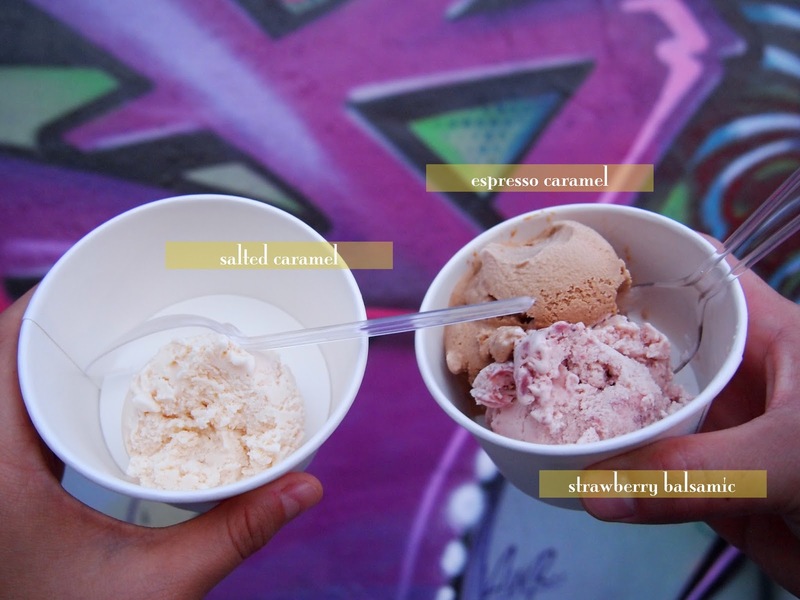 So, I did some research on Yelp, and I dragged BDF to two new-to-us ice-cream spots in LA - Neveux Artisan Creamery and Carmela. Carmela is on 3rd Street, right across from the new Trader Joe's on Fairfax. It was actually pretty easy to find street parking, but the line at Carmela took much longer than anticipated. Carmela's new shop is tiny, with just a small table for customers, but the aesthetic was adorable. 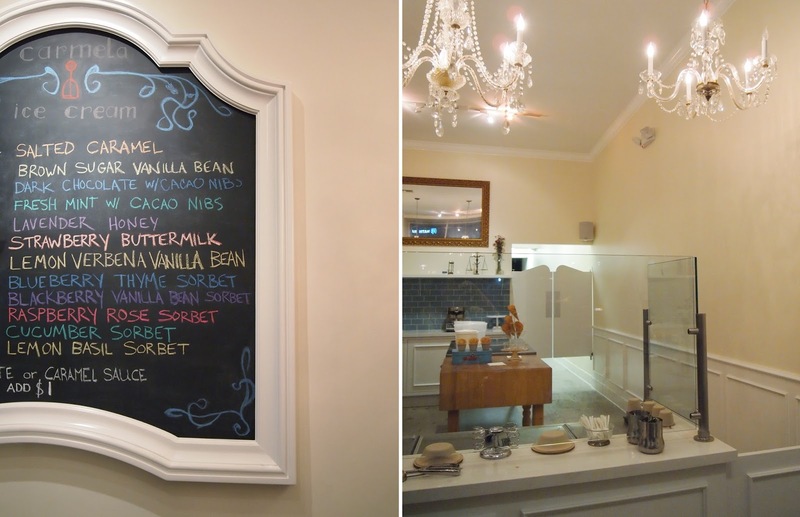 It was very ice cream parlor-ish. The flavor selection is wider than the one at Neveux, and the scoops are much more generous too. 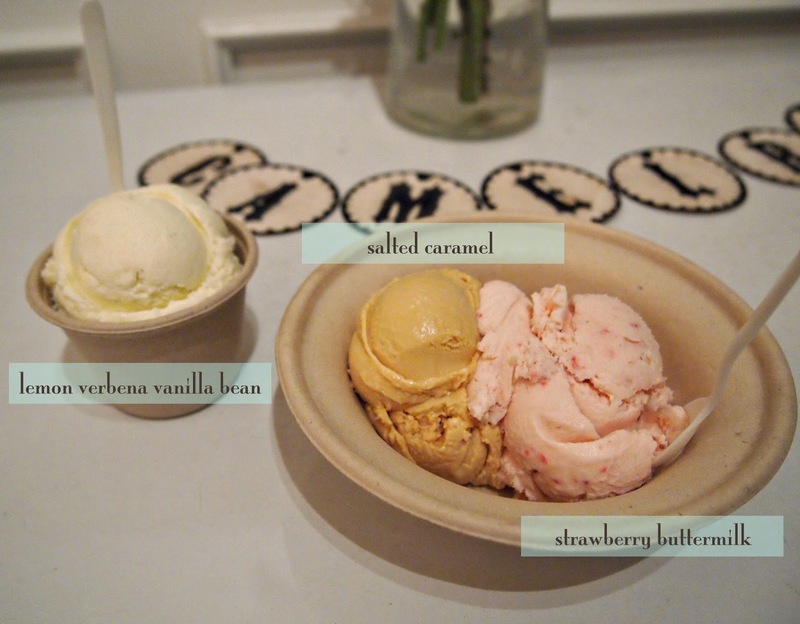 I tried the salted caramel and strawberry buttermilk, and BDF tried the lemon verbena vanilla bean. The strawberry buttermilk was delicious, and it had a slight tang that I think can be attributed to the buttermilk. The salted caramel was decent, but had an artificial tint to it. It was trying too hard to be salted caramel ... if that makes any sense. BDF's lemon vanilla ice cream was delicious; classic vanilla with a slight summer zing to it. Neveux Artisan Creamery is on Melrose, and parking can be a challenge in the evenings. After circling no less than 3 times, we found a spot a block away. I tried a scoop of the salted caramel, and BDF got two scoops - the espresso caramel and strawberry balsamic. The salted caramel was pretty heavenly, and I think it was the clear winner in my mini taste test. The strawberry ice cream was interesting, but a little too much vinegary when eating the whole scoop. The espresso caramel was very good, and the taste of the coffee was strong. The flavors at Neveux were more sophisticated and intense. 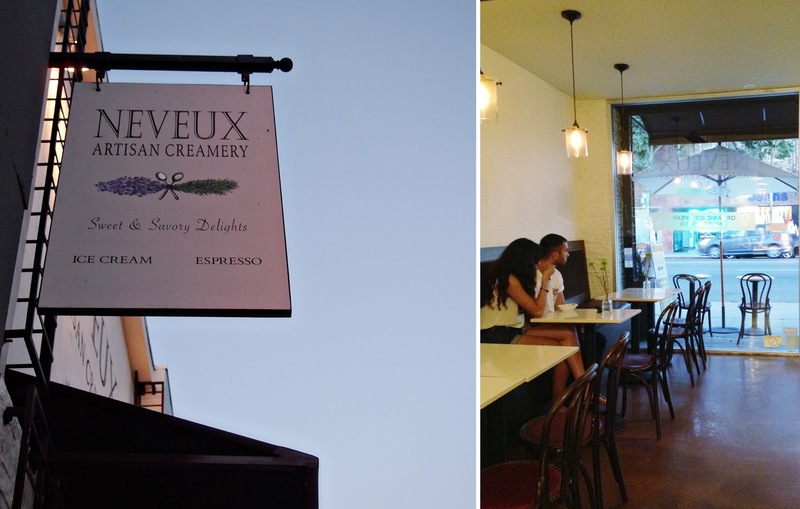 Neveux's eat-in area was roomy and calm, but it was pretty warm in there. It was great to get out and try out these new dessert spots. Ice cream is the perfect complement for warm LA summer nights. Call me if you think you might be in an ice-cream rut. I'll diagnose you and rush you to the nearest ice cream spot!